We are regarded as the notable manufacturer, exporter and supplier of an extensive Printed Paper Twisted Handle Carry Bag. This attractive deign Kraft bag is used for carrying clothes and gift items in malls and gift shops respectively. In addition to this, offered bag has fine print on it which creates difference among other present in market. We make sure it is manufactured in variable length and prints for our valued patrons. we assure our client to give them a good quality. We, Fresco Print Pack Pvt. Ltd. from 2015 are one of the famous manufacturers of an extensive array of Paper Bag. 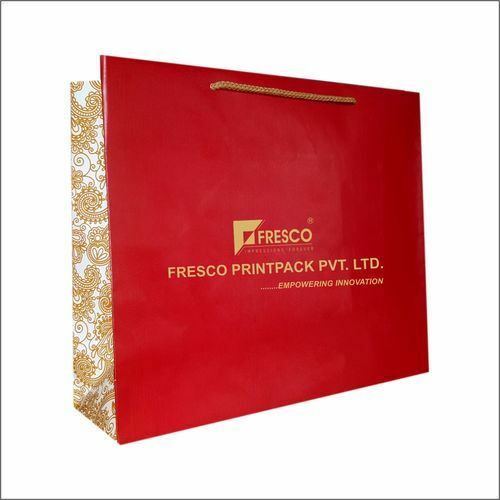 Our offered range consists of best grade Premium Paper Bags, Printed Paper Bags, and Wedding Gift Bags. The products we are offering are admired for their sturdy designs, crack resistance, long service life and perfect size. These are available in different sizes and designs and other requirements as per the various choice of our clients.